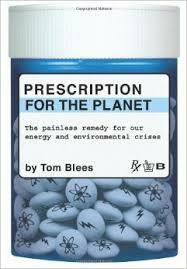 We need a second industrial revolution that produces non-toxic goods from clean energy and renewable materials. We need a sustainable, non-polluting, non-depleting industrial ecosystem that meets our needs while repairing the environment. This is called ‘Industrial Ecology’, and studies material flows from beginning to end. It works to massively reduce the quantity of raw materials we consume and then throw away. It shrinks the initial input by recycling the output. Industrial ecology analyses city design, transport systems, mining, construction, and layouts. It’s not just material flows through the system, but the impacts those flows have downstream. It works with New Urbanism to minimise, where economically possible, the distances goods have to travel. It keeps cities clean and non-toxic, and increases the useful biomass in a region. It heals, rather than hinders. As such, it is hard to define and moves across many disciplines but here are a few of the topics that stand out for me. Will an oil crisis stop mining? As this great Worldchanging article points out we are exponentially increasing our use of minerals and metals, and that this cannot last indefinitely. Where does your stuff come from? Before the store, before the factory, where did it really begin? If it isn’t made of wood, cloth, or other living matter, it was dug out of the ground. Instead, we need to consider manufacturing processes that can eliminate waste not just to cut pollution and landfill, but because the ingredients themselves are important. This is why I am so keen on the Plasma Burner which can efficiently (and almost economically) recycle even old joggers and dirty diapers. My peak metals page covers the race for the world’s ever dwindling supplies of metal, and where some vast new metal deposits could be mined (the bottom of the sea!) But what if we could do away with the need for as much metal in the first place, or replace metal entirely? We are close to doing just that in the vast construction industry. Instead of steel framed skyscrapers, architects build higher and higher skyscrapers out of wood! This can lock up billions of tons of CO2, and is such an exciting concept I’ve devoted a whole page to it. See Tall Timbers for more. Not only this, but government websites are advising on how to build suburban homes out of renewable materials like mud brick, straw bale, car-tyres, Earth-ships and all that jazz. See Earth Works for more. Once we have separated out all easy recyclable materials like paper and glass and steel and organics for recycling, everything else could be recycled in a plasma burner. This means that even disposable nappies (diapers) and old running shoes can become petrochemical goods like sunglasses and glues, or building materials like rock-wool and fibreglass and tiles and pavers. Some researchers are developing alternative plastics that don’t use petrochemicals, some associations are prioritizing green within their members, whole green-chem institutes are being founded, and groups are trying to teach chemists to green their processes. Green chemistry, also called sustainable chemistry, is a philosophy of chemical research and engineering that encourages the design of products and processes that minimize the use and generation of hazardous substances. Whereas environmental chemistry is the chemistry of the natural environment, and of pollutant chemicals in nature, green chemistry seeks to reduce and prevent pollution at its source. In 1990 the Pollution Prevention Act was passed in the United States. This act helped create a modus operandi for dealing with pollution in an original and innovative way. It aims to avoid problems before they happen. via Green chemistry – Wikipedia, the free encyclopedia. 4. Open Source Hardware for the poor: tractors and industrial equipment that you build and maintain from local materials and parts at 1/8th the cost of name brands! Because the Open Source Hardware movement is more about social justice for the poor than sustainability itself, I moved it to a new page called Free Hardware Designs. 5. Will an oil crisis stop mining? I was always wondering whether to put this comment here or on my transport page. Patrick’s comment below helped me decide that it belongs here. In an oil or diesel crisis, mining equipment can be converted to run largely on electricity or ‘rechargable’ boron (see point 8 here where even Dr James Hansen says boron is in with a chance against competitors like hydrogen). 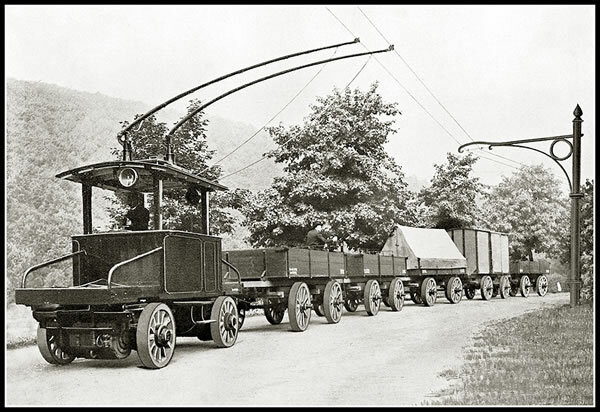 But for now let’s just remember that we used to transport goods and even mine with electric trolley trucks, and we can do it again. (More on this Hamburg line here). Who needs batteries? Here’s a hybrid trolley truck that could be refitted to run on small amounts of biodiesel when necessary, but uses about 70-80% less fuel than normal mines, and saves the mine money! This stuff is not hard. At the moment, it’s just economics, and some politics. But that will change as peak oil and carbon taxes gradually wean us off the bad stuff. One thing I rarely see mentioned is the urgent need to reinvent mining and manufacturing to run on electricity and batteries instead of diesel. If the machines used to build nuclear reactors are still powered with fossil fuels, then a reactor can’t replicate itself. I think battery technology is already good enough to achieve the kind of horsepower that would be required, since Tesla has the Model S and it has 400 hp. 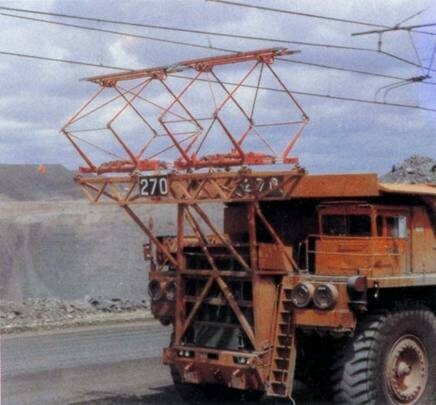 I think we could also run mining and construction machines directly on electricity, they would just have big power cables coming out of them. Thanks for your comment. I’ve always been uncomfortable with this page, and am slowly going to tinker with it (as I do all my summary pages) in the years ahead. There’s so much more to say about Industrial Ecosystems, but my time is limited. I’m meant to be writing my Young Adult fiction story! Anyway, see point 4 above.